Meet the new uploader: he's built with Angularjs and comes in a nice modal window with drag and drop support for uploading files. 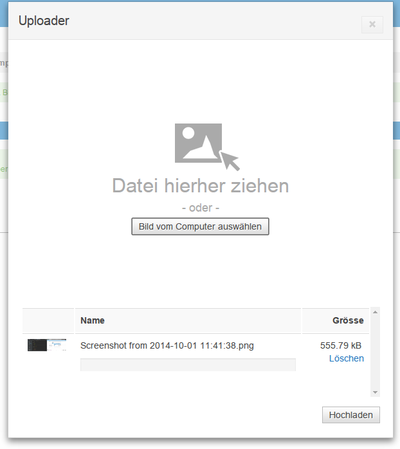 You can even specify how many files the user can upload and what size they should be. This article deprecates the old documentation (Development_Uploader_pre_5.0) as from now on only this one should be used. To initialize the uploader create a new instance of \Cx\Core_Modules\Uploader\Model\Entity\Uploader in your code which gets called when the page is built. This should normally be the Frontend- or BackendController. For our simple example we use the DefaultUploadCallback class which just uploads the files into the /image/content folder of your cloudrexx installation. With the method getXHtml you can get the needed html code for the uploader button. You can then use this in combination with the Sigma template to add the button somewhere in your template, by calling the setVariable method like shown below. For the example below to work you have to have a placeholder with the name UPLOADER_CODE in your template, else the uploader won't be visible. The description for all options is described below. When the upload is finished the uploader will call the uploadFinished method of the class with the specified arguments in the UploadCallbackInterface class. * @param $tempPath String Path to the temporary directory containing the files at this moment. * @param $tempWebPath String Points to the same folder as tempPath, but relative to the webroot. * @param $data String Data given to setData() when creating the uploader. * @param $uploadId integer Per-session unique id for the current upload. * @return mixed The return value can be an array as shown in the example or null. *               When returning an array, all files left in the temporary directory are moved accordingly. *               When returning null, all left files are deleted. You can find a example for a callback in the \Cx\Core_Modules\Uploader\Model\DefaultUploadCallback class. The uploader injects the \Cx\Core\Core\Controller\Cx instance as a first parameter in the contructor so we don't have to use singeltons or global objects. The method uploadFinished should return an array with the location where the uploaded file should be moved. $uploader->setCallback('gallery.afterUpload'); //Function attached to window which gets called when the upload window is closed after an successful upload. The first parameter is the array with the uploaded files. With the setOptions method you can set html attributes. You can specify how many files the user can upload by using the method setUploadLimit. To set a maximum file size limit you can use the setMaxFileSize method. The method accepts numeric or formatted string values, e.g. : 204800 or "204800b" or "200kb". To create a inline uploader you have to use the setType method. If you need data like a id for the callback you can add this data with the setData method of the uploader. The data is then available as the $data argument in the callback method. If you need a additional class for the uploader button you can use the addClass method of the uploader. Finally with the getXHtml method you can get the html necessary to create the uploader button. The first argument is the button name. Then we can migrate the callback to the new uploader. The name of the method is the same for the new and old uploader, so if your new uploader instance is created with the same name ($uploader) you can leave it as it is. If you also have a folder widget displaying the files which the user has uploaded you have to migrate this too. Replace the following code with the new folder widget instance. New code for folder widget instance. To place the folder widget html in the template you can use the getXHtml method. This page was last edited on 14 August 2018, at 02:49.